One hundred years of photography from a very particular corner of Europe. 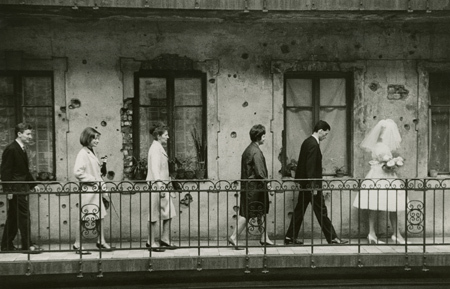 One of the most compelling photographs in the Royal Academy of Arts show “Eyewitness: Hungarian Photography in the 20th Century” is László Fejes’ “Wedding” (1965). “Eyewitness: Hungarian Photography in the 20th Century” Through October 2. Royal Academy of Arts, London. “Wedding” comes near the end of a show that chronicles nearly 70 years of Hungarian and European history through the eyes of five leading photographers. While their Hungarian names are a mystery to many of us today — Gyula Halász, Endre Ernö Friedmann, Andor Kohn, Lásló Weisz, Márton Mermelstein — their photographs have become iconic images of the 20th century. Brassaï’s demi-monde of Montmartre and Montparnasse at night. The haunting and shocking war photojournalism of Robert Capa. The intimate moments of quotidian life in André Kertész’s Paris and New York. László Moholy-Nagy’s rich, modernist explorations in Bauhaus aesthetics and photograms. Martin Munkácsi’s innovative and energetic fashion photography. In his catalog essay, curator Colin Ford quotes the Hungarian writer Arthur Koestler, who said: “Hungarians are the only people in Europe without racial or linguistic relatives in Europe, therefore they are the loneliest on this continent …Hopeless solitude feeds their creativity, their desire for achieving.” He concludes, “To be Hungarian is a collective neurosis.” This idea haunts the show, though it is not so much neurosis that frames this exhibition but rather movement and influence, as it strives to define the importance and influence of Hungary to the history of photography. But it is Fejes’ “Wedding” that best captures the experience of “Eyewitness,” for just as the photograph of a wedding isn’t really about a wedding, the exhibition isn’t really about Hungarian photography. The exhibition was organized on the occasion of Hungary assuming the presidency of the European Union in 2011, just nine years after the country entered the EU. The show is packed with more than 200 photographs by 50 artists; to experience the show is to dive into a vast archive of European collective memory. Throughout the galleries, I had a sense of being somewhere between the past and the future, between a shell-pocked façade and a wedding procession, and in this space I kept asking myself: What makes Hungarian photography Hungarian? For much of the 20th century, Hungary existed in a constant flux, like a lung expanding and contracting with new governments and uprisings; breathing in and expelling artists, intellectuals, Jews, Romanians; and shifting its borders and politics inward or outward with each war victory or defeat. In 1896, Budapest celebrated 1,000 years of its existence. It held a World’s Fair to mark the occasion and showcase the city’s internationalism alive with ideas and European sophistication. After its defeat in World War I, the country lost more than 70 percent of its territory. Hungary’s citizens dispersed among the neighboring countries, many migrating to the overcrowded towns and cities across the border. By the early 1920s, reactionary nationalism ruled the country and rejected the internationalism that had been growing for decades. Within this wave of nationalism came an embrace of peasants, a suspicion of intellectuals and artists, and a rising anti-Semitism. Brassaï, Capa, Kertész, Moholy-Nagy, and Munkácsi were all Jews, and by the end of the 1920s they, along with a good many other artists and intellectuals, left Hungary. They moved to Berlin, Paris, London, or New York and created new names for themselves. 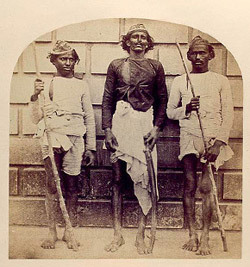 Their language, unique and distinct from any other European language, fostered an isolation for many of these émigrés. For the photographers, the visual language of the camera filled the silence. Capa’s war photojournalism is perhaps the most familiar work of the show. His famous and often discussed “Death of a Loyalist Militiaman” (1936), first published in Vu magazine, defined Capa’s entire career. But there are also the photos he took as he travelled around Europe just after World War II. Capa had an eye for ruin whether buildings or soldiers. Capa famously said, “If your pictures are not good enough, you are not close enough.” He left Budapest when he was 20, going first to Weimar Berlin and then Paris. In Paris, he began using his childhood nickname (capa is Hungarian for “shark”) because he thought it “sounded right for a fictious American photographer.” “Death of a Loyalist Militiaman” was used for the cover of a book of Capa’s Spanish Civil War photographs entitled Death in the Making. His shocking war photographs would find greedy audiences in the pages of the fast growing picture magazines such as Life, Picture Post, and Vu. Capa showed us how to look at war, until he got too close to a land mind in Vietnam in 1954 when that war was just beginning. The show has a good deal of death-in-the-making, but the focus is often the aftermath of war. Civilian hangings, destroyed bridges and towns, corpses from mass burials. There is the haunting specter of death as well. In World War II, Hungary was caught between Fascist Germany and the Soviet army. Alinging with Germany, the country deported more than 200,000 Jews to Auschwitz. János Babai’s “Jewish People in Kosze at the Railroad Station” (1944) is a terribly simple photograph of a crowd of men and women, old and young, rich and poor, waiting for a train. In the background, several people unload luggage from a truck. And then you notice the soldier in the lower right, rigid and attentive. You notice the woman near him with her hands covering her face, and the details in the scene start to build the context of the image. The camera is elevated such that the perspective is one from above, looking down on the anonymous crowd. This photograph is not about Jews, but about their removal. As Germany’s defeat loomed, Hungary secretly negotiated a failed truce with the Allies. Budapest was the center of one of the last major battles, when German troops attacked the city in the winter of 1944. The civilian casualty list was long. The Soviet army looted the city after defeating the Germans, turning the tragedies of the siege into the horrors of occupation with thousands more killed and raped. Capa returned to his native city to capture the destruction in eerily quite photographs of burned-out building and crumpled bridges, unusually expansive and distant images for a photographer who strove to get close. Amidst the death and destruction, the images of everyday life most captivated me. The familiar images of Brassaï’s 1920s Parisian couples cornered in café tables, their gestures caught in mirrors, doubled and tripled from all sides such that the reflections can be more captivating than the couples themselves. Brassaï, who was born in Brasso, Translyvania (an area that was ceded to Romania after World War I), only took up photography, so the story goes, when he met Kertész one night in Paris in the late 1920s. He famously claimed “the only birth date which matters to me is not Brasso 1899, but Paris 1933.” That was just after he published Paris de Nuit, which captured the dark streets and chaotic underworld of Paris in images of mysterious dream-time slumber. The book established his reputation. He never returned to Hungary. Karoly Escher stayed in Budapest. His “Bank Manager at the Baths” (1938) evokes a moment in the daily life of the city just on the verge of another war. 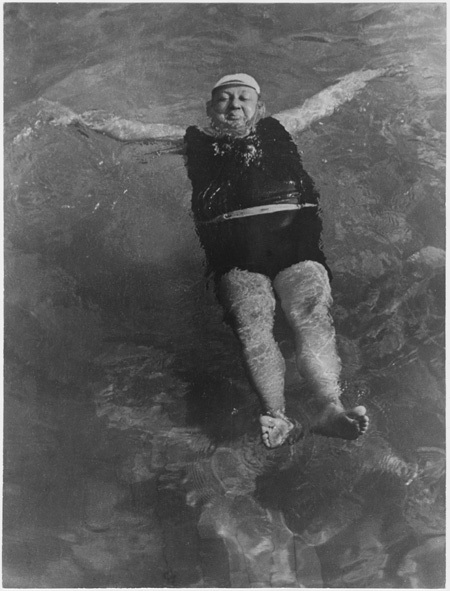 Escher was not interested in politically motivated photography, so the exhibition claims, but the bloated, black bathing suit and the contented face of the banker may hint at a deeper, perhaps unintended critique. Kertész’s photographs are more than social critique. He showed us a way of seeing that didn’t transform the subject into symbol. His photographs hold a personal encounter between camera and subject. Cecil Beaton once said that Kertész was “always awaiting the unfamiliar.” Like Brassaï and Moholy-Nagy, he served in the First World War. But unlike the others, Kertész took his camera and saw neither the idealization of heroism nor the destruction of war, but rather the mundane moments of being a soldier. His photo “Latrine” (1915) presents four soldiers cramped together in an outdoor latrine in the woods of Poland, each mentally isolated from the other and ignoring Kertész’s camera. It is photo of war, but an unfamiliar view of the degradations of conflict. Kertész did more than document a subject. He documented a way of seeing the most common moment around us. 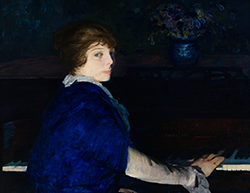 “Accordionist” (1916) evokes this quality. The musician fills nearly the entire frame, his dark clothing and instrument contrasting against a white wall. He is caught in a moment of performance, his head slightly tilted downward, unaware of Kertész or us. The intrigue of Kertész photographs, like so many others in the show, rests in how such quotidian moments transform into something to look at — something to photograph. If the Hungarians taught us anything, it was new ways of looking through a camera lens. The dominant theme of the show is not Hungary but rather migrating from it, which only confused me more about the nature of Hungarian photography. The three main galleries have “moving away” in their titles, and all but Kertész started photographing after they left Hungary. Martin Munkácsi moved to Berlin in 1928 and eventually to New York in the mid-’30s, where he developed a successful fashion portfolio. 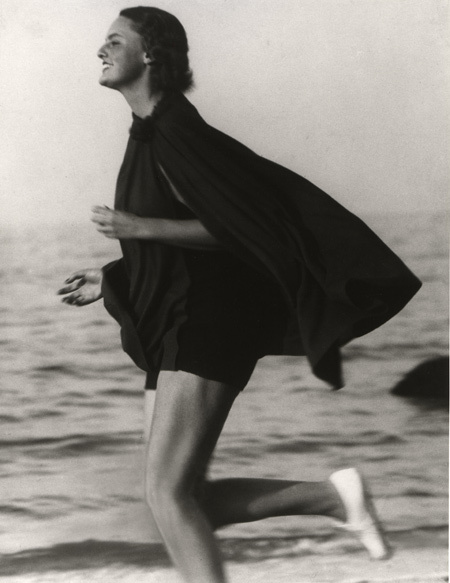 His “The First Fashion Photo for Harper’s Bazaar” (1933) draws on his early experiences with the camera as a sports photographer. He had the model run along the beach, her dark cape flowing behind her. Munkácsi continued to take his models outdoors, shooting them in action and natural lighting, a quality that would become the norm for later photographers such as Richard Avedon. Movement was not a simple gesture for Munkácsi, but a way of turning the often static nature of photography into a moment of energy. 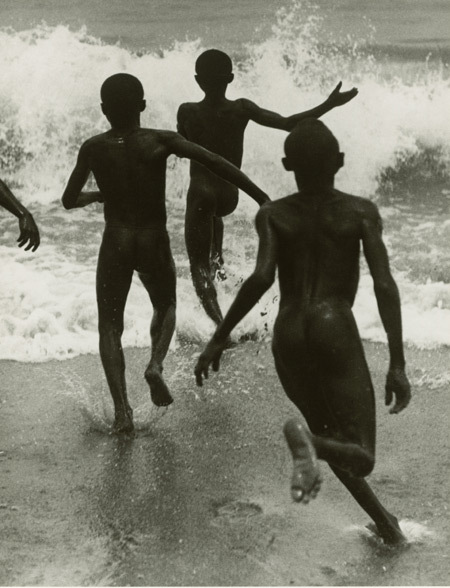 “Four Boys at Lake Tanganyika” (1930) captures this approach, situating us behind the boys as they race toward the rushing waves, legs in motion, arms and hands outstretched. We run with them into the white dazzling foam of the surf, or at least we feels as if we could. As a young photographer Cartier-Bresson admired this photo for its ability to “fix eternity in a moment” and claimed it was the only photograph that influenced his work. Moving away became less possible in the post-war Communist era. Hungary changed its name to the People’s Republic of Hungary in 1949. “The only kind of photography approved by the state was Socialist Realism,” the text tells us, and we again are looking at grand vistas of workers in factories and farmers in the fields, photographs that are more symbolic than lyrical, more state-sanctioned that individual. In the mid-1950s, the republication of Kata Kálmán’s Tiborc (1937), which documented the poverty of the countryside in the 1930s, encouraged new social documentary work in the period, most notably the series by Peter Korniss on Romanian peasants in the 1960s. But as the years move on, the galleries get smaller and the subject matter, aside from Fejes’ “Wedding,” loses its imaginative force.